For this week’s sector focus, I thought I’d take a look at sector ETF that’s sold off a bit lately. The BMO Equal weight utilities ETF (ZUT) fell from its high of $16.50 to the bottom of its recent trading range at around $15. The main cause of this abrupt fall was two of the securities held – Atlantic Power (ATP ) and Just Energy (JE). These stocks have had strong drawdown’s recently. ATP cut its dividend by 2/3rds, which caused the stock to fall about 2/3rds in price. JE fell after some fears over a further dividend cut to their stock, having already implemented one a while ago. The CEO of JE recently assured investors of its earnings guidance and dividends as being stable, which gave some comeback to the stock. Meanwhile, ATP remains depressed. ZUT was affected by these stocks decline. ZUT has a high concentration of securities – only 13 names are held in the portfolio – making the rather rapid and violent decline in these two stocks impact the ETF more than a more diversified portfolio. In contrast to ATP and JE, the balance of this ETF is in more predictable names including Atco, Pembina, Fortis and Emera. Given the technical support at $15, its 5% dividend and the likelihood of most of the bad news for the two stocks mentioned above being out of the way, ZUT looks to be attractive right now. Further, utilities tend to be comparatively stronger during the seasonal “worst six months” from May to October. I hold a position of ZUT in the ValueTrend equity platforms that I manage, which I bought in the mid $15’s. 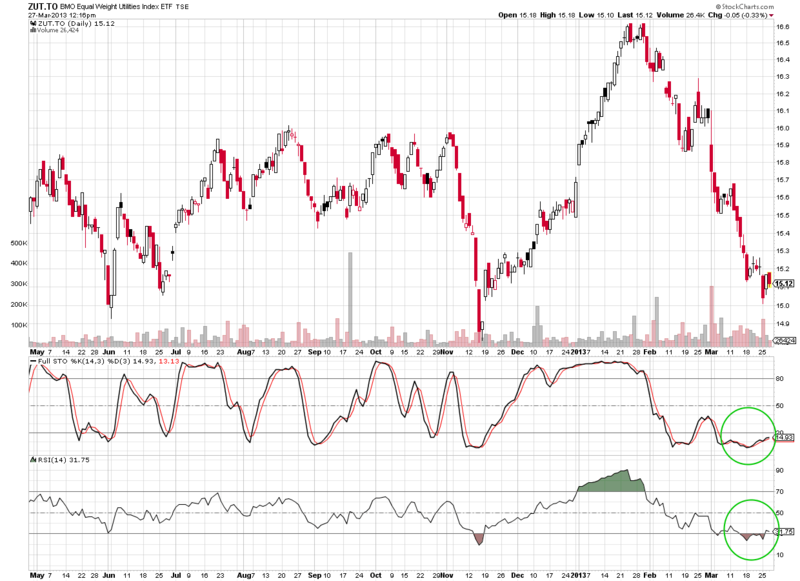 The long termed chart at the top shows support at $15/share for this ETF, and the daily chart above shows near termed upside potential as RSI and stochastics begin to move up from an oversold condition. Tune in to BNN next Friday April 5th to catch me live on BNN’s 6:00 pm call-in show. I posted a fun chart noting the possible correlation between Tiger Woods’ golf wins and the Dow, originally provided by my friend Steve Gage. On the blog, it was noted that (according to the chart) Tiger was due for a winning streak, given the Dow’s rally of late. Here’s the blog: https://www.valuetrend.ca/?p=1976. 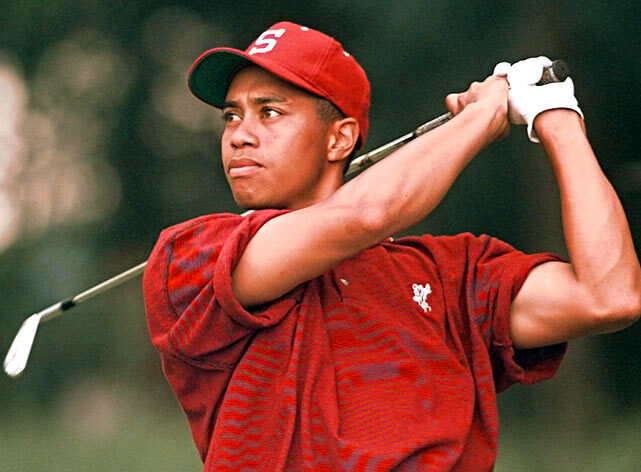 Sure enough, Tiger has moved into the top spot in the world again. I don’t follow golf at all, but for those who do, have fun with this correlation (or coincidence)! I think that using technicals on a secotr ETF is the same as any index position–the two stocks in question are oversold, thus may indeed be the driver within the group to push it up (although my target would not be to $16.50–more like $16 which is its traditional trading range high over the recent past). Either way, the ETF has support at $15, and may be a decent hold for those who want to collect the dividend and see if it can pop a buck. Keith: I have watched the BMO covered call ETF’s since their inception. What is happening to the covered call etf ZWB is what I expected, that is selling the covered calls is actually eroding return when compared to ZEB. Surprisingly, the BMO covered call utilities ZWU is outperforming the ZUT. You have said that you own ZUT and must have looked at ZWU. What is your opinion of ZWU and why do you not own it instead? Read your blog weekly, thanks. I actually own both ZUT and ZWU – but the ZUT has been for my pure-equity account. I like the ZWU for the income sided accounts I manage,which are more of the (dare I utter these words…) “buy and hold” type of accounts. Well, nothing is truly buy and hold these days, but lets just say that the extra income affords holding ZWU for a longer period of time. And I do note, as you do, that its had less downside in the drawdown of late–not sure why, but will ask horizons next time I speak with their people.